This Photocast of a June 30 Capital Regiment rehearsal in Forrest, Ill., follows the corps from rehearsal site to performance at the DCI Central Illinois major event in Normal, Ill. The photo gallery in this feature is accompanied by audio interviews with Rick Bays, Capital Regiment director, who discusses the corps' 2006 program, "Life Rhythms: Work, Rest & Play," and brass section member Brandon Christie, who talks about his pre-show routine. Photocast is a regular feature for Season Pass members. 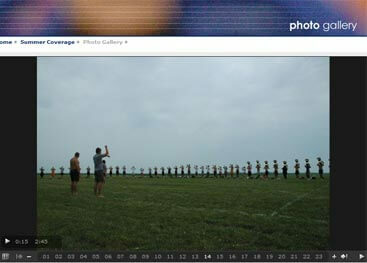 Photocast archives can be accessed on seasonpass.dci.org. Learn more about becoming a member of the DCI Season Pass.